We have been working on cause and effect activities with Toddler Bee. He's at a stage where he is very interested in why and how things happen. All day long it's "why why why". The other day, we had a 15 minute conversation about poop. "Why do I poop?" "How do I poop?" "How do you make poop?" If you are lucky (or unlucky, depending on your view) to live in a climate where you get snow during the winter than you'll understand that outdoor activities can be fairly limited. Outside playtime is hard to manage with two little kids and sub-zero temperatures. But, there are some activities you can do to get the kids (and you!) out of the house for some fresh air. Which is where our day of Snow Discovery came in. First, we decided to make a "Snow-cano". 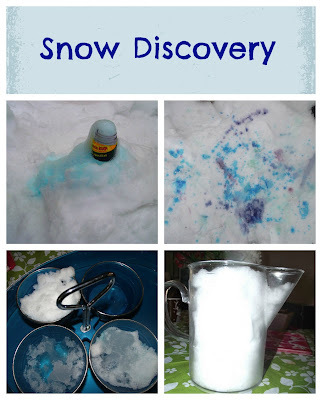 I've talked before about how mixing baking soda with vinegar and watching the reaction is one of Toddler Bee's favourite activities and what could be better than adding colouring and snow to that mix? The process is simple. Just get a clean/empty bottle - preferably a smaller one with a wide bottom and narrow neck. Then, add some baking soda to the bottle and bury it up to the neck in snow. We added food colouring to our vinegar and some dish soap for some extra bubbles. Then, have your child pour the vinegar into the bottle and see what happens! Next, we did some snow painting! For this, you could use water colours or acrylics mixed with water but we get plenty of birds in our backyard and I didn't want them eating any paint. So, we mixed food colouring in water and Toddler Bee experimented with different tools. He used brushes, spray bottles, and syringes to make patterns and mix colours. I asked him what he thought would happen when he mixed one colour with another and what would happen when the colours touched the snow. We also experimented with snow prints, though I don't have any pictures of that. We made foot prints in the snow and took toys and other objects and guessed at what shape or pattern they would make when pressed into snow piles. The cries of, "I'm cold!" started soon after that so we came inside along with a bowl of clean snow. In a four separate containers we added equal amounts of snow. Then, I gave Toddler Bee containers of water in varying temperatures, from ice cubes to boiling water. Make sure you are extra careful when using boiling water! Then, I asked Toddler Bee what he thought would happen when we added the ice, cold water, warm water, and hot water to the snow. He very excitedly told Papa Bee that hot makes snow melt really fast and cold makes snow melt really slow. Then, for our final experiment, we took a measuring jug and filled it to the top with snow. I asked Toddler Bee what he thought would happen to the snow. He said he thought it would go away. And, he was right in a sense. We checked on it every so often and observed how the snow was melting. We also discovered that there was much less water at the end than there had been snow. Having fun and exploring with your kids doesn't have to be expensive and doesn't even need to involve leaving your backyard! You can use almost anything you find around your house to create fun and excitement for your children; it's just a matter of looking!